FG invites parents to meet freed Chibok girls – Royal Times of Nigeria. The Federal Government has invited parents of the 82 released Chibok girls to Abuja to meet with their daughters on Friday May 19th. 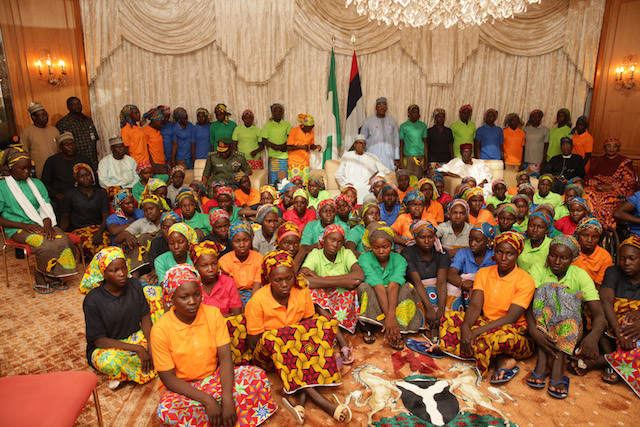 The 82 Chibok school girls who were released on May 6th after they were swapped with some Boko Haram commanders have been in Abuja since May 7th. They are currently undergoing a reorientation programme. Chairman, Chibok Community in Abuja Hosea Tsambido, said this in an interview. Leaders of the Chibok community met with the Federal government last week and they were handed photographs of the released Chibok girls for proper identification..